Black POW MIA Rescue Pocket Knife Spring Assisted Opening - Heavy duty rescue pocket knife featuring a black handle with a POW MIA theme. 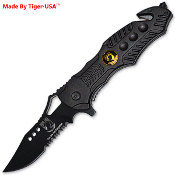 Razor sharp 1065 stainless steel half serrated blade reads, "YOU ARE NOT FORGOTTEN" and includes the POW/MIA symbol. Embedded handle emblem includes POW/MIA symbol. Handy pocket/belt clip. Spring Assisted - Press the index or use the thumb stud, and it flies open and "snaps" in place. Quality construction utilizing torx screws and steel components. The included steel tip window breaker makes this a valuable rescue tool.